Hi, I just picked up an old lime green FX-25 . However all of the wires to the board are un-attached,and even a couple jack wires are off. 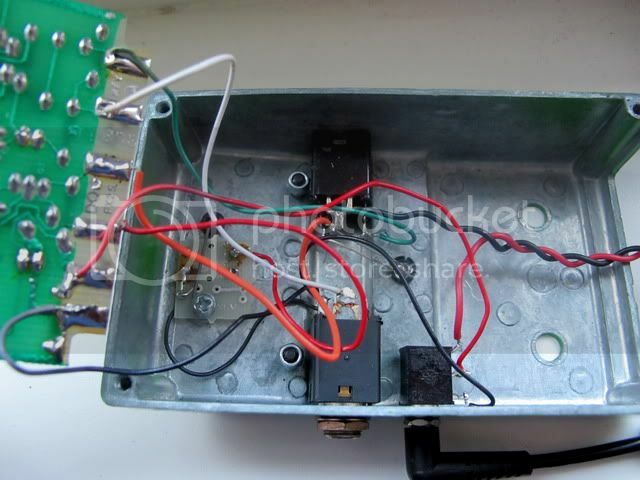 I knew this was going to be a project but it looks like I need some assistance.Does anybody have one of these that they could take apart,pull the board out and take a couple photos of the wireing? I would be eternally gratefull! 1st edition DOD FX-25 envelope filter, help/pics needed! Hi folks, I am placing a call for help! I have an early DOD FX-25. I bought it as a project but am requesting a photo or two of the wiring if anybody has one of these.When I received it it would NOT switch on or off, so I replaced the footswitch and still no luck.Then I replaced the 14007 ic and it is switching fine.However there is no output when on,only when off.The wiring had been re-done when i bought it so I'm feeling there is a good possibility that maybe something is screwy there. The wires and connections are solid,but being that they arent original I suspect there may be a problem there.The circuit protection diodes are fine,and I tried piggybacking the two ca3094 chips with ca3080's and the lm1458 with another lm1458 to no avail,so I dont beleive its the ic's either.I changed the 47uf electrolytic,and installed a blue led as the original was blown, but I'm at a loss for what the problem is. Any suggestions or photos would be greatly appreciated! 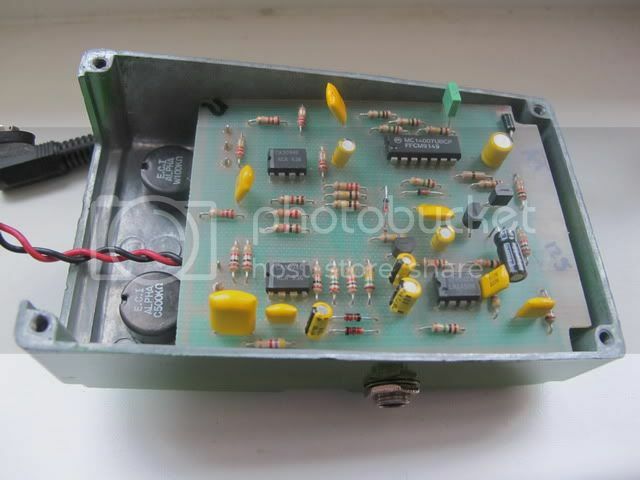 Obviously this pedal was damaged early in its life,cause it doesnt have a scratch on it,came in the original box,and had a blown 14007 switching ic. Re: 1st edition DOD FX-25 envelope filter, help/pics needed! Hi and thanks for the reply.I have the schematic but no audio probe.I'm really hoping for a photo to see if the wiring was done correctly.I had a hunch that the switching problem was the 14007 chip,and since my dod compressor had one I swapped them out and it works! Maybe I should try to use an audio probe again,but the last time was a miserable failure.Everything I touched sounded the same through my amp,and I eventually gave up. 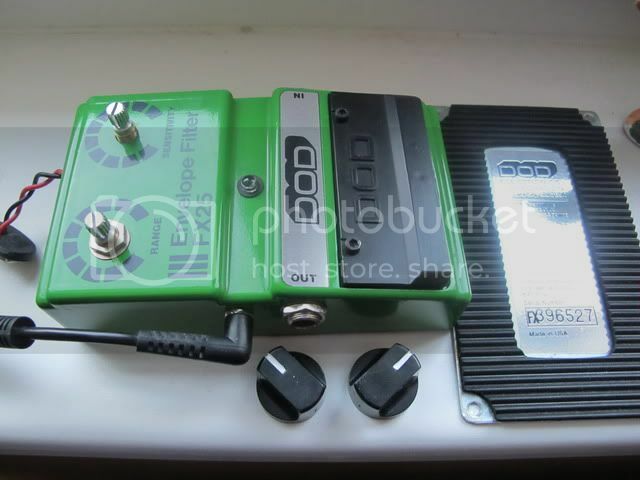 I'd even be willing to send it to somebody [in Europe] on this forum more qualified than me to fix it Cause I really want this on my pedalboard! Any suggestions,hunches or photos are appreciated!! Thanks Boris,I just did over on the 'Request Folder' sub-forum. With the audio probe I'm getting nothing from Q2 which is marked j113. Thats a j201? if you don't get any signal past Q2 it means the switching system is not working: either Q2 is fried, or the control voltage does not arrive on it... so look in that direction. nowI notice this is the request folder... should we go on here?! MarcoMike wrote: if you don't get any signal past Q2 it means the switching system is not working: either Q2 is fried, or the control voltage does not arrive on it... so look in that direction. OOps, I suppose there is a better place to request help. Maybe the moderators can move this to a more visible forum? If not I will start it over again tommarow. I'll check out Q2 again then as well.And the 100k was r6 I suppose,so that should not be audible with the probe? DOD FX-25 rev -A gut shots / opinions needed! Hi folks, I am placing a call for help! I posted this in the 'Requests folder' by mistake ,hopefully more people will see it here! I have an early DOD FX-25. I bought it as a project but am requesting a photo or two of the wiring if anybody has one of these.When I received it it would NOT switch on or off, so I replaced the footswitch and still no luck.Then I replaced the 14007 ic and it is switching fine.However there is no output when on,only when off.The wiring had been re-done when i bought it so I'm feeling there is a good possibility that maybe something is screwy there. The wires and connections are solid,but being that they arent original I suspect there may be a problem there.The circuit protection diodes are fine,and I tried piggybacking the two ca3094 chips with ca3080's and the lm1458 with another lm1458 to no avail,so I dont beleive its the ic's either.Ireflowed the solder joints,and inspected them all for bridges or cold joints.I changed a 47uf electrolytic,and installed a blue led as the original was blown, but I'm at a loss for what the problem is. The original owner said he bought it as a repair from a closing music shop.Obviously this pedal was damaged early in its life,cause it doesnt have a scratch on it,came in the original box,and had a blown 14007 switching ic,so somebody probably used the wrong adapter. I'm still kind of a newb at this, but I'm determined to get this one working! Just made an audio probe and I'm getting nothing from Q2, so that may be my next component swap.Only it is a j111, maybe a j201 would work? But first,any photos of the wiring would be greatly appreciated! soulsonic wrote: Which one is that? I have a handful of older DOD pedals. Re: DOD FX-25 rev -A gut shots / opinions needed! OK........ it now looks like I did have a couple bad diodes ,D-1 and D-2,upon replacement I'm now getting audio from the probe along the entire input,with no bad resistors,caps,diodes or Ic's. So now If anybody out there has one of these I really need a photo of the wiring.I'm 90% sure thats where the problem is. I'll buy you a round if you ever come to Prague! Ok,I'll try to get some pics on saturday. I would agree that this does sound like maybe the FET switching around Q2 could be to blame, the JFET itself could be fried. Did you try shorting from Source to Drain on Q2 to see if there was any difference? Have you checked for signal at Pin 4 of U2 with the effect activated?? The only thing I'd want to really comment on is that piggybacking ICs in circuit really isn't a reliable way to check for a failed IC. For example, if a short has developed inside the IC (as can happen frequently), and it shorts the audio signal path to ground, then a piggybacked IC would make no difference at all. Add to that that putting two healthy ICs in parallel like that can actually cause the circuit to fail anyway! The only reliable way to verify the ICs is to either verify that all the other components around them are OK and connected properly, thus indicating that the IC has failed, or remove and replace. Even then, there is always the possibility that the replacement part is either faulty from new, or gets damaged during the soldering!